Connecting, communicating and creating in Netherlands. The country of the Netherlands is where the Rhine enters the sea. It is a country which has physically built itself out of the inhospitable North Sea. Often called Holland – which is the name of one (actually two) of its provinces – it even more confusingly for the English speaking world inhabited by the Dutch speaking Dutch. If you really want to know more about Holl.. er sorry, The Netherlands watch the video at the bottom of this piece. Lots of pictures from the event! The size of this event was in marked contrast to the Brussels meet which was overshadowed by the terrible terrorist attacks in that city only three weeks earlier which presented transport difficulties. This time there were over one thousand six hundred delegates filling the huge hall of the Hague Convention Centre. Another difference referred to in many of the discussions both formal and informal were the two great uncertainties effecting all businesses and industries – the possibility of a trade war with the USA under its current administration and nearer home the aftermath of the BREXIT decision – the exit of the British from the largest economic bloc on the planet. Many developments have been put on the long finger pending clarification on these issues. “This is a conference for users by users.” she said. It is a place to discuss users’ practical experiences; continuing our profissional development; learning best practice and proven solutions and technology roadmaps. But above all it presented an opportunity to connect with industry leaders, users and of course Emerson experts. For other or more detailed information on happenings and/or offerings revealed at this event. The emphasis is on the totality of services and packages not on individual boxes. Emerson’s European President Roel Van Doren was next to address the assembly. We should know our plant but be unafraid to use expertese and knowledge to keep it fit for purpose. Monitor the plant constantly, analyse what is required and then act. This means seeing how the latest advances might improve production. This means harnessing the “new technologies.” In passing he drew our attention that Emerson had been recognised earlier this year as ‘Industrial IoT Company of the Year’ by IoT Breakthrough. A very striking presentation was given by Dirk Reineld, Senior VP Indirect Procurement with BASF. He brought us to the top of Rome’s Via de Conciliazione on 19th April 2005. We saw the huge crowd looking towards the centre balcony as the election of a new pope was announced. He then moved forward to the 13th March in 2013, the same place but what a difference in such a short time. This time it seemed that everybody had a mobile phone held to take photographs of the announcement of the election of Francis. All we could see was a sea of little screens. He used this to emphasize a point “We are underestimating what is happening & its speed.” This is not helped by a natural conservatism among plant engineers. Change is happening and we either embrace it or get left behind. It is becoming more and more clear that in front of us “the path is digital!” He presented some useful examples of digitalisation and collaboration at BASF. Registered delegates have access to slides from the main presentation programme. These slides are available for download via the Emerson Exchange 365 community (EE365). Emerson Exchange 365 is separate from the Emerson Exchange website that presenters & delegates used before Exchange in The Hague. So, to verify your attendance at this year’s conference, you must provide the email you used to register for Exchange in The Hague. If you are not already a member of EE365 you will be required to join. To access the presentations, visit The Hague 2018 and follow the prompts. The first prompt will ask you to join or sign in. 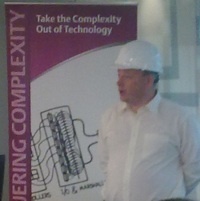 Something in this particular EmrEx emphasised how things are moving and those unprepared for the change. Among some of the press people and others there was disappointment expressed that there was not a printed programme as in previous years. This correspondent is used to going away into a corner and combing through the printed agenda and selecting the most relevant sessions to attend. This was all available on line through the “Emerson Exchange Web App.” This was heralded as a “a great preshow planning tool.” All we had to do was enter a link into our our web-browser on our phones and away you went. Yes this is the way to go certainly and although I am inclined to be adventurous in using social media etc I and some (if not many) others found this a step too far to early. It was not clear that a printed version of the programme would not be available and the first hour of a conference is not the best time to make oneself au fait with a new app. Having said that while many of the journos took notes using pencil and paper they were not adverse to taking photos of the presentation slades so they could not be said to qualify as complete luddites! He postulated five essential competancies for digital transformation. Automated workflows: Eliminate repetitive tasks and streamline standard operations. Decision support: Leverage analytics and embedded exportise. Mobility: Secure on-demand access to information and expertese. Change management: Accelerate the adoption of operational best practices. Workforce upskilling: Enable workers to acquire knowledge and experience faster. The next speaker was Roberta Pacciani, C&P Manager Integrated Gas and Upstream Technology with Shell. She is also President of the Women’s Network at Shell Netherlands. She spoke on leveraging the best available talent to solve future challenges. I suppose that we would have classified this as a feminist talk but of course it isn’t. As the presenter said it is not so much a feminist issue as a people issue. “Closing the gender gap in engineering and technology makes the future.” This was a useful presentation (and in this correspondent’s experience unusual) and hopefully will be helpful in changing perceptions and preconceptions in STEM and our own particular sector. As partof EmrEX there is an exhibition, demonstration area. Delegates may see innovative technologies applied to their plant environment. They meet with experts about topics such as getting their assets IIoT ready or how to use a Digital Twin to increase performance and explore options to prepare their plant for the future. As a guide – printed as well as on-line – the produced a Metro-like guide. Using this we could embark on a journey through products, services and solutions where Emerson together with their partners could help solve operational and project challenges. One of the most popular exhibits was the digital workforce experience. Here we visited a plant and were transported magically to former times to see just how different plant management is now and particularly with the help of wireless and digitisation. One of the good things about this sort of event is the opportunity to meet friends for the first time though social media. Sometimes one does not know they are attending unless the tweet something. Thus I realised that an Emerson engineer was present and so I went looking for him in the expos area. This it was that Aaron Crews from Austin (TX US) and I met for the first time after knowing each other through twitter & facebook for a frightening ten years. Another of these virtual friends, Jim Cahill, says, “It hasn’t happened without a picture!” So here is that picture. The following morning there were a series of automation forum dedicated to various sectors. 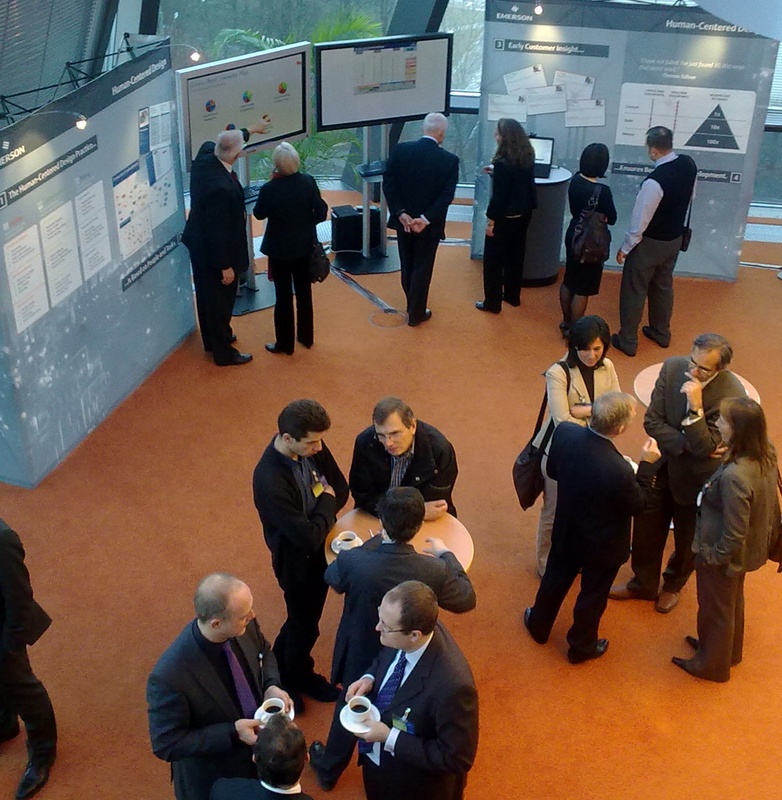 The Life-Sciences Forum was one which was very well attended. Ireland is of course a leader in this sector and we hope to have a specific item on this in the near future. Emerson have invested heavily in the national support services as we reported recently. Each evening there were social events which provided further opportunities for networking. One of these was a visit to the iconic Louwman Transport Museum where reside possibly the largest collections of road vehicles from sedan chairs through the earliest motor cars up to the sleekest modern examples. These are all contained in a beautiful building. The display was very effectively presented and one didn’t have to be a petrol-head – and believe me there were some among the attendance – to appreciate it. It is impossible to fully report an event like this in detail. One can follow it on twitter as it happens of course. And there will be copies of many of the presentations and videos of some of the sessions on the website. The Emerson User Group Exchange – Americas will continue “spurring innovation” in San Antonio (TX USA) from 1st to 5th October 2018. It looks exciting too. Playing football will never be the same! Armac plays the field! In the Netherlands, we are told, people live by the thought that measuring is the key to knowing. This grew from the wish to keep everything under control. Numbers don’t lie, so they measure everything. Even in the most popular sport in the Netherlands (and the world): soccer (sorry America! ), voices are rising to take all variables in hand and rule out the factor of luck as far as possible. Thus standardisation of circumstances is the solution! One of these standards is being achieved by making the field with artificial grass instead of the unreliable natural grass. When this grass then is measured in quality and other parameters, a “standard” field is on it’s way. This now is made possible by Deltec, in close corporation with Armac! The number of football fields with artificial grass is steadily growing, but it is still an expensive commodity for most clubs as well as community or public sport providers. Natural grass needs a lot of attention but artificial grass is only optimised when it is installed correctly and adequately maintained. This is important in creating a perfect artificial field, that increases the pleasure of playing, lowers the chances of injuries and prolongs lifespan considerably. The brain of Deltec’s Club Tester, made by Armac, is capable of registering and processing over 10.000 variables per second! One of the devices within the Club Set is the Club Tester, which Armac has designed with extreme precision to measure the exact values of a simulated descent of a foot on the field and the particular behaviour of the artificial grass as it happenst. Due to high demands on the precision of measuring, the company used its creativity to its full potential in hardware and software engineering. As a result, results that are accurately filtered from 10.000 variables in one second, in which the sensitivity of the acceleration sensor on 10 millivolt per G (falling force) must fall within a range between -200 and +200 G. “It took us quite some patience and accurate working to “catch” the highest and lowest values from such enormous range of data”, says software engineer Marcel van de Kamp of Armac all who as about the project. The close cooperation between Deltec Metaal and Armac in the Netherlands has resulted in a way to compare easily the artificial grass field variables with the official FIFA guide lines, which are the international standard. With the Club Tester a field is monitored and so injuries are minimized and the club enjoys longer a perfectly kept artificial grass field. As wind power stations continue to increase in size, the demands for more sophisticated technology is also increased in order to ensure a high degree of efficiency and thus maximise profitability for operators. This primarily affects the automatic adjustment of blade angles, for which some particularly interesting solutions have been developed. For centuries now we have been utilising wind power to perform vital tasks, such as the grounding of grains or the irrigation of fields. While the windmills that we now admire in the Dutch countryside or when approaching Mallorca by air still have a distinct charm, today’s industrial wind turbines (from 1 MW upwards) are highly complex systems, equipped with state-of-the-art technology, which will provide hundreds of households with electricity for many years to come. In the meantime, wind power stations have become a major business and, alongside solar, biogas and water power stations, are amongst our most important alternative energy sources. As the current boom in wind power emerged, a great deal of effort was made to utilise existing generator technology to the greatest possible extent in order to ensure that systems were ready for the market in the shortest possible time. This often resulted in substandard systems, however, in spite of their enormous potential to reap the benefits from one of our most important renewable energy sources. Further developments in wind power technology have not only significantly increased system capacity, but have also improved reliability. These key factors alone made systems of this kind a worthwhile, profitable investment for operators. In all types of wind turbines, adjustment to the respective prevailing weather conditions plays a crucial role. While millers had to shorten the coverings on their sails if the wind became too strong, this adjustment is now performed on older wind turbines by stalling them, which is determined by the shape of the rotor blades and occurs automatically according to wind strength. However, this passive technology is far too inefficient for modern systems, as this method leaves a large proportion of the potential energy available unused. The solution is to actively adjust the angle or pitch of the rotor blades, a central function for modern wind turbines from a particular size. The pitch control of these gigantic rotors serves two functions: to optimise the electric power yield for the respective prevailing wind strength and to safely stop the systems during strong winds or in the case of an emergency. Modern systems for adjusting blade angles either take the form of a simple, collective design in which all blades are adjusted using a common linkage, or they take the form of more complex solutions with individual blade adjustment, where each rotor blade can be adjusted on an individual basis. Engineers therefore had to set out to find drive solutions for the blade adjustment. Older systems were predominantly equipped with hydraulic drive systems, which have subsequently proven to be too large, heavy and inaccurate as well as requiring a high level of maintenance. This is why modern systems work with electromotive blade adjusting drives. With suitable electronics these solutions can be controlled to a significantly higher degree of accuracy, reduce maintenance costs and, furthermore, do not involve the risk of hydraulic oil leaking into the sea or onto agricultural land, which could result in fatal consequences at typical locations of systems of this kind. Until recently, even state-of-the-art pitch control systems have used relatively traditional technologies such as AC induction motors or brushed DC motors with accompanying electronic components for speed or position control. But in the same way that turbine technology shifted from dual-fed induction generators (DFIGs) driven by large, complex gearheads, over to directly driven permanent magnet synchronous machines, the use of higher-performance, brushless, permanent magnet motors in pitch control is also on the rise. The arguments supporting this technology range from its compact design and high level of dynamic accuracy in comparison with AC induction motors, to its low maintenance costs when compared with brushed DC motors. Just as important as selecting a suitable motor is the matter of optimising power transmission. Dynamics, reliability and service requirements are again the main point of focus when it comes to selecting the gearheads. On the one hand, the gearheads must work to a high level of precision, as rotor blades are only adjusted by a few degrees for an optimum wind yield. On the other hand, incredibly fast motions are required if the rotor has to be stopped during a storm or other emergencies. In these cases, the rotor blades are brought into the so-called feather position and taken out of the wind within a matter of seconds. In addition to this, the gearheads must also work to a reliable standard in adverse environmental conditions: whether located in the humid climate of Texas, the coldness of Siberia or the salty air of the North Sea. Systems should also be maintenance-free to the greatest possible extent, as each standstill is costly and there is a great deal of expense involved in terms of both time and money in accessing systems in elevated positions. Further components of a wind turbine, in which robust, weather-resistant drive systems are required, can be found, for example, on the maintenance door. The door is often so heavy that it is difficult to open it manually – especially if it is frozen over with snow and ice. 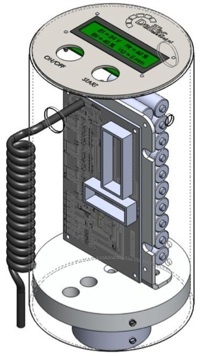 For this purpose, supporting drive spindles or linear actuators are used here. The same technology is applied at the rotor brake, which reliably holds the rotor in its parked position if wind conditions do not permit operation or when maintenance or inspection work is performed. If a drive does not function as it should, this can result in catastrophic consequences, both for the entire system and the technicians or for the area directly surrounding a wind turbine. Thomson, one of the world’s leading providers of drive systems, is now offering special products and solutions, which are tailor-made for usage in wind turbines. For the pitch control of wind turbines, UltraTrue planetary gearheads from Micron come highly recommended. Micron, the planetary gearhead specialist, is part of Thomson, which manufactures a wide range of innovative, linear drive technology products. In the case of Micron UltraTrue gearheads, development focuses upon two central requirements: maximum possible performance and moderate costs. These essential features are facilitated by helical planet pinions, housing and shafts made from stainless steel as well as tapered roller bearings and spherical roller bearings. This results in considerable savings for wind turbine operators, both in terms of purchase and failure-proof operation, while significantly lowering maintenance costs in comparison with many other systems. What’s so special about the Micron planetary gearheads is the ingenious pinion arrangement, in which three so-called ‘planet gears’ are rotated by a drive pinion or ‘sun wheel’. The planet gears rotate within a gear ring, which is normally milled directly into the inside of the housing. A particularly rigid design emerges from this, ensuring a high degree of torsional stiffness for the entire gearhead unit. As the load applied to the output shaft is distributed onto planet pinions in equal measure, a planetary gearhead has a higher loading rate than a helical gearhead of the same size. In addition to this, several gearheads can be accommodated in a limited space, meaning that extremely high transmissions are possible. While standard systems provide maximum transmissions of 100:1, with its rectangular- shaped gearheads Micron offers transmissions of up to 500:1 as standard. Kollmorgen, a Thomson sister company, provides tailored solutions for pitch control based on robust, tried and tested products such as brushless EC motors (electronically commutated motors). These motors are resistant to even the harshest of environmental conditions. They have been specially developed and tested to fulfil the highest standards with regard to resistance to temperature, impacts and vibrations, meaning that they can even be used in military applications. The EC motor is the result of decades of development work by Kollmorgen in the field of brushless motors in the highest performance range. Depending on customer requirements, these motors can be combined with various tried and tested control electronics platforms. Kollmorgen offers pitch control solutions in both the high-voltage (230-460 V AC) and the low-voltage range (24-80 V DC). Kollmorgen motors can also be combined with various gearhead versions in line with specific customer requirements. Thomson also provides linear actuators and drive spindles for use in wind power stations. Its extensive product range offers extremely robust precision solutions that can cope with loads of up to 50,000 N. They work effortlessly in the salty air of sand storms, in places where there are extreme temperature fluctuations, in crisp cold conditions or under high loads resulting from vibrations and impacts. The E150 actuator from the Electrak Pro product range, for example, is frequently used as the drive for the rotor brake. These modules are designed for axial loads of up to 9,000 N, provide maximum dynamic load speeds of 38 mm/s and have a robust load holding brake. Thanks to their resistant and corrosion-proof aluminium housing (IP66 protection), they can be used virtually anywhere where there is a high ingress level of dust, pollution or water and continuous, reliable and maintenance-free operation is an absolute must. Equipped with these high-performance drive components, the next development phase in the field of pitch control has already been scheduled and has to a certain extent already begun. This, for example, includes the implementation of highly developed control strategies for blade adjustment in the form of a multivariable control system. Technology of this kind opens up additional opportunities for further increasing the yield of wind turbines. It may also be possible to integrate load data from the status monitoring system of the rotor blades and the turbine tower into a continuous control cycle for adjusting the blades. A system would therefore be able to work closer to its upper operating point without the risk of damages. Thanks to this kind of optimisation, the pitch system is able to maximise the torque supplied to the generator and thereby increase its output power without exceeding the permitted loads on the rotor blades or the tower. As a next step, a computer model of the occurring vibrations and unbalances could be incorporated into the control algorithm to continually adjust the individual pitch of each rotor blade regardless of its actual position. The field of renewable energy resources is currently experiencing an extremely interesting phase. Continual developments in both the fields of wind power technology and other renewable energy resources will in the long term enable us to provide future generations with power generation procedures, allowing us to effectively protect valuable resources. #EMReu Conquest of complexity advances! Our journey to Berlin was somewhat disrupted by the vicissitudes of the Irish weather. Coming out in obvious sympathy to the woes of what will hopefully bring an end to Ireland’s banking debacle, the weather decided to inflict the coldest cold spell for November on record with the resultant delays in flights. But enough of our travel travails! Why were we going to Berlin? And what happened when we eventually arrived? Emerson Process Management organise a press event most years to discuss with members of the Europen press from the steppes of Russia to the rocky west coast of Ireland and the deep fjords of Norway to the level plains of Spain. Last year from the Netherlands we were introduced to their concept and activities under the heading Conquering Complexity. This time with the German capital Berlin as venue, this theme was utilised again, Conquering Complexity 2010. 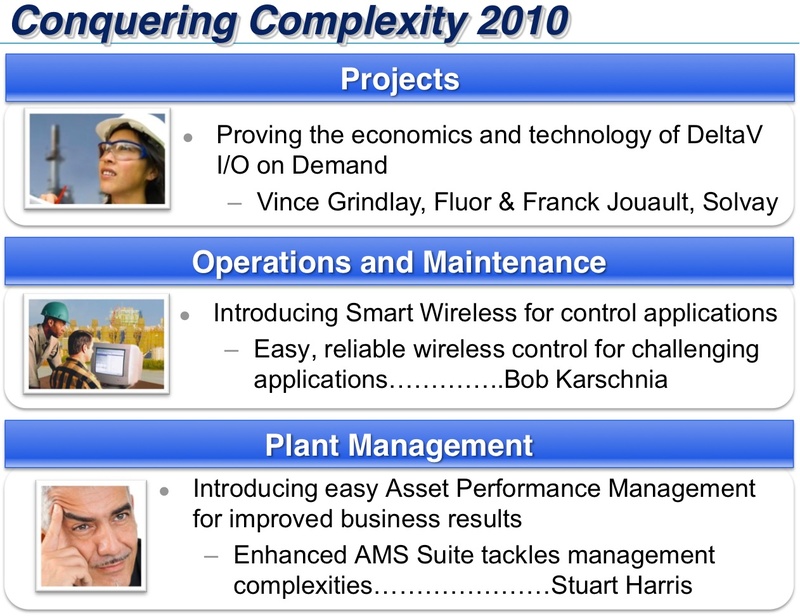 In effect what it presented was an insight into the way Emerson Process Management is engaging this complexity challenge and how the conquest is progressing. During this event we tweeted comments and pictures from the #EMReu in Berlin for the benefit of those unable to attend. The reason we were able to tweet so effectively was because the facilities in the venue were easy to use and available free of charge. We just had to turn on our MAC and away we went…pictures, comments etc. as the event progressed. Kudos to organisers, HHC Lewis and to progressive hotel – the unique Radisson Blu, Berlin. Thanks also to those who retweeted and acknowledged what we were doing? We were welcomed by Bob Sharp, last year’s “new boy” as Emerson’s President in Europe and now well into position. He presented us with a run down of the company and how it is endevouring to be local while harnessing the benefits of global experience. The Emerson presence in Europe was emphasised and indeed was further strengthened by the international character of the presenters and presentations. One point he emphasised (or maybe we thought he emphasised it!) was that there is only one international industrial wireless standard – the IEC standard which is WirelessHART. We were to hear it again! First presentations examined the project challenge with practical examples proving the economics and technology of using their Delta V I/O on demand. Here Vince Grindley, of Fluor Supply Chain Solutions, who made a study of the impact of electronic marshalling on the project execution process. The point was that “like the golf swing, projects are all about complexity.” Indeed one could say that complexity as a subject was invented for projects! This particular evaluation was undertaken to capture documentation and present the benefits offered by Delta V electronic marshalling and the impact on the project execution by comparison with a traditional DeltaV v10 engineering approach. Frank Jouault is manager of the System Department at the Tavaux (F) plant of Solvay. His presentation was in French, with Emerson’s Wireless Sales Director, Ann Robin, as an able translator who refreshingly knew about the subject and so gave an intelligent and meaningful transmission to the presentation for those whose French was not up to standard. He talked about the company’s experience with CHARMS (CHARacterization ModuleS). His conclusions: They confirmed that the CHARMS to be compatible with all the field devices typically used by Solvay in Tavaux which included many devices from non-Emerson suppliers. He reckoned the “should make some profits” and more convincingly he anticipates they will use CHARM I/O on future projects, And, more tantalisingly maybe use wireless and CHARM I/O in the junction box in the field. The next session consolidated this with a presentation from Stuart Harris, Emerson’s Vice President and General Manager Asset Optimisation. He was ably abetted by the irrepressible Travis Hesketh, VP Wireless & PlantWeb Europe, who started the session as a plant operative and finished as plant manager, possibly one of the fastest promotions in automation history. This included a video presentation where a manager and his team have a morning meeting, looking at the plant but unable to really assess things as a co-ordinated whole. This presentation was to expose the conventional reactive decision making process (they called it Darkness)and how that is transformed using their AMS suite to what the call the Predictive which replaces Darkness with Insight. Then, with the help of their partnership with Meridium, on to the Proactive (Clarity Focus).Meridium on to the Proactive (Clarity Focus). Thus from the virtual unknowingness of the “Darkness” the process plant now manager gains first insight which increases reliability and allows the building of a maintenance programme and then through to the proactive which enable sensible and realistic business strategies to be developed. This new enhancement, which they call Asset Performance Management, thus enables management to integrate predictive intelligence with asset reliability information; view real-time analyses and reports of asset health and availability; and create management strategies for reaching new levels of performance. Finally there was a question and answer session where the assembled journalists were able to put questions to the speakers and receive answers. All in all it was a useful meeting and showed the importance of companies not only in explaining what they are doing, their plans for the future but also in showing their philosophy in deciding these plans and concrete examples of where this philosopht or approach is helping the end user. The event ended with the various press people dispersing to their various home bases with decidedly mixed success depending on the effect of the unusual weather especially in the western islands of Britain and Ireland. Some even had the pleasure of extra overnight stays at the expense of the air line because of airport closures. 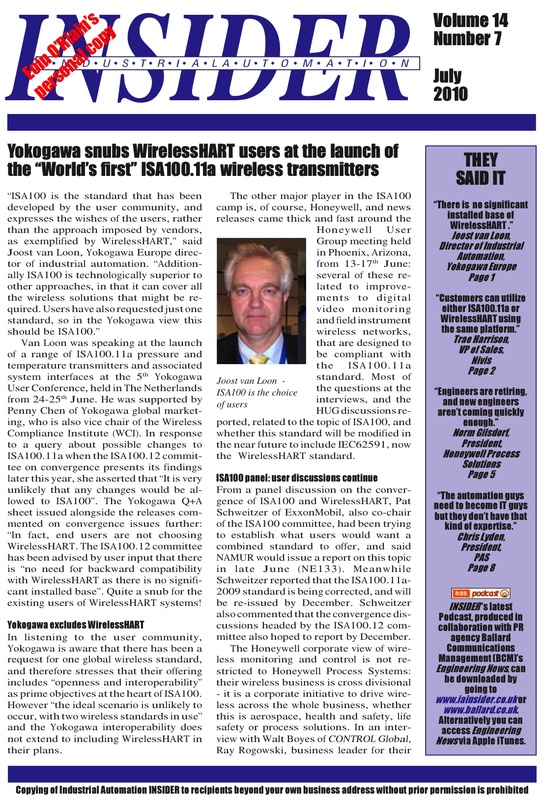 Yokogawa snubs WirelessHART users at the launch of the “World’s first” ISA100.11a wireless transmitters. Van Loon was speaking at the launch of a range of ISA100.11a pressure and temperature transmitters and associated system interfaces at the 5th Yokogawa User Conference, held in The Netherlands from 24-25th June. He was supported by Penny Chen of Yokogawa global marketing, who is also vice chair of the Wireless Compliance Institute (WCI). In response to a query about possible changes to ISA100.11a when the ISA100.12 committee on convergence presents its findings later this year, she asserted that “It is very unlikely that any changes would be allowed to ISA100”. The Yokogawa Q+A sheet issued alongside the releases commented on convergence issues further: “In fact, end users are not choosing WirelessHART. The ISA100.12 committee has been advised by user input that there is “no need for backward compatibility with WirelessHART as there is no significant installed base”. Quite a snub for the existing users of WirelessHART systems! In listening to the user community, Yokogawa is aware that there has been a request for one global wireless standard, and therefore stresses that their offering includes “openness and interoperability” as prime objectives at the heart of ISA100. However “the ideal scenario is unlikely to occur, with two wireless standards in use” and the Yokogawa interoperability does not extend to including WirelessHART in their plans. The other major player in the ISA100 camp is, of course, Honeywell, and news releases came thick and fast around the Honeywell User Group meeting held in Phoenix (AZ US), from 13-17th June: several of these related to improvements to digital video monitoring and field instrument wireless networks, that are designed to be compliant with the ISA100.11a standard. Most of the questions at the interviews, and the HUG discussions reported, related to the topic of ISA100, and whether this standard will be modified in the near future to include IEC62591, now the WirelessHART standard. From a panel discussion on the convergence of ISA100 and WirelessHART, Pat Schweitzer of ExxonMobil, also co-chair of the ISA100 committee, had been trying to establish what users would want a combined standard to offer, and said NAMUR would issue a report on this topic in late June (NE133). Meanwhile Schweitzer reported that the ISA100.11a- 2009 standard is being corrected, and will be re-issued by December. Schweitzer also commented that the convergence discussions headed by the ISA100.12 committee also hoped to report by December. The Honeywell corporate view of wireless monitoring and control is not restricted to Honeywell Process Systems: their wireless business is cross divisional – it is a corporate initiative to drive wireless across the whole business, whether this is aerospace, health and safety, life safety or process solutions. In an interview (podcast) with Walt Boyes of CONTROL Global, Ray Rogowski, business leader for their wireless initiative, stressed that they see a far larger potential for the OneWireless applications in addition to monitoring field sensors. Add to this that the Honeywell OneWireless system is really a combination of up to five wireless systems: the Honeywell approach is to create a wireless infrastructure that will support multiple wireless networks, multiple applications, with specific sensor developments to feed in, possibly on different types of wireless system – an example of this is the support for Wi-Fi devices in addition to the field sensor network. The inevitable conclusion is that Honeywell would have no problem with running two wireless systems into their networks, WirelessHART and ISA100, if that is needed. The Matrikon acquisition reported last month will enable the integration of third party systems into the Honeywell system via an OPC link, again possibly over OneWireless. In the theme of following the Emerson THUM and the ABB FieldKey, Honeywell showed a new OneWireless Adaptor that connects to wired HART devices, and transmits the full diagnostic info to host systems via an ISA100.11a compliant wireless network, without any significant modification to the conventional 4- 20mA loop field wiring. Yokogawa also suggested that they would be supplying such an adaptor, sourced from a suitable third party supplier. With the new Yokogawa products compliant with ISA100.11a and GE and Yamatake joining the Wireless Compliance Institute board, alongside Yokogawa and Fuji, Honeywell and ISA100 have gained valuable support recently. However, their spokesmen continue to stress that any ISA100 standard must be based on the total customer requirement, and that these customers are requesting a single wireless standard. You can’t halp feeling that ISA, WCI and Yokogawa have been talking to a different lot of customers, unless, of course, they’ve only been asking the questions that give the answers they want to hear! Maybe we’re fast approaching the point where users will simply adopt WirelessHART and ISA100.11a as appropriate to their particular applications. This blog has been on-line for twelve months now and we have been looking at the stats over that period. We have two blog presences one on the Blogger platform and this one on the WordPress system. We use the blogger presence for recording press releases as we get them with little editing other then some tidying up. This WordPress blog is used however, for material we write ourselves, or those written by guest authors. Reports on technologies, events, applications, company news and what we think are interesting topics to do with the automation field all find their way here. Because it is a fairly new venture for us we were not sure what to expect. What sort of reaction we would get. Who, or how many would visit. The Read-out Instrumentation Signpost is the principal and oldest presence of Read-out, Ireland’s journal of instrumentation, control and automation, on the world wide web. It is visited by between 4000 to 6000 unique visitors during each week. (When we started gathering statistics around ten years ago this figure was around 500!). So what has happened in the last twelve months on this blog site? The stats show that almost 4500 visitors visited the blog during the period, the bulk of which occured in the final six months. The first two months showed less that 70 visitors per month but then showed a steady rise up to the current average of 400 per month. Whether that is good or bad is difficult to say and it is also difficult to analyse these figures to decide why certain topics are more popular than others. One thing that is interesting is that visits occur to different pages through the period and not just at the time they go on-line. Perhaps surprisingly the most visited post visited was a piece about a presentation on Industrial Security which featured at the ISAExpo’09 with about 6%. The report on the actual show itself was way down in the ratings in 16th place. 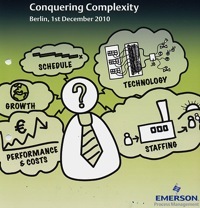 The next most frequented page was the report on a press event hosed by Emerson in the Netherlands in December. This report was narrowly pipped at the post by 4 visits by the Security feature. Other Emerson events also feature in the top ten, the User Group Meeting in October at fifth and Andrew Bond’s article on their CHARM launch also in October at seventh. This probably reflects the open attitude to social networking displayed by Emerson and their customers, when compared with some other automation entities. A very close number three on our top-ten is the report on the splitting of GE Industrial Platforms and Fanuc (August’09). This was followed by a report on what Walt Boyes has identified as the “coming together” of Invensys in July’09, a report on the re-organisation of this giant in the automation world after a traumatic decade. At number six is an item on Longwatch’s progress towards the “HMI revolution” with their integrated video into HMI systems (November 2009). We had reported the launch of this one our other blog in September’09. Number eight is our own particular favourite and was a critique on a book that we came across and which was recommended by Jon DiPietro of Bridge-Soft at ISAExpo’09. 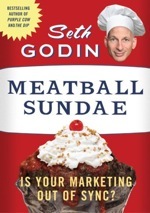 The book was called Meatball Sundae by a guy called Seth Godin. This easy to read book made an impression and this posting outlined some of his ideas. Number nine was a surprise to us as it was the one item that last year attracted the most consistent viewings. Why? Because it talked about AN1H1 or “Swine flu”. It talked about an IR measuring system which could measure body temperature at a distance and thus be used in airports and other ports of entry and identify possible sufferers before they contaminated others. We suspect that this is so high because people googling for AN1H3 or Swine Flu would find this in their search. Number ten is one that is fast moving up the list. This is John Saysell’s “Top Ten Tips for the Industrial Trainer” which was posted in January of this year. Most referrals not surprisingly came from our own website – read-out.net – but not a few came from Longwatch, MCP Europe and Emerson as well as various twitter and other social-networking referral sites. Obviously many of our visitor clicked on the various links from the site. These do not we feel have great significence since there are too many variables like how many times they are mentioned in various blogs etc. But top of the list is ControlGlobal’s story of the split-up of GE & Fanuc, followed by Jim Pinto’s pages, Industrial Automation Insider and Jim Cahill’s Emerson Proicess Experts. Top searches during the period were “GE Fanuc Split”, “AN1H3”, “INVENSYS”, and various Emerson personalities it would be too invidious to mention! We posted 107 articles and we received 17,337 messages of which 75 were legitimate and 17262 were Spam Messages (protected by Akismet, the stop comment spam used by WordPress – phew!). A graphical representation of twelve months viewing! 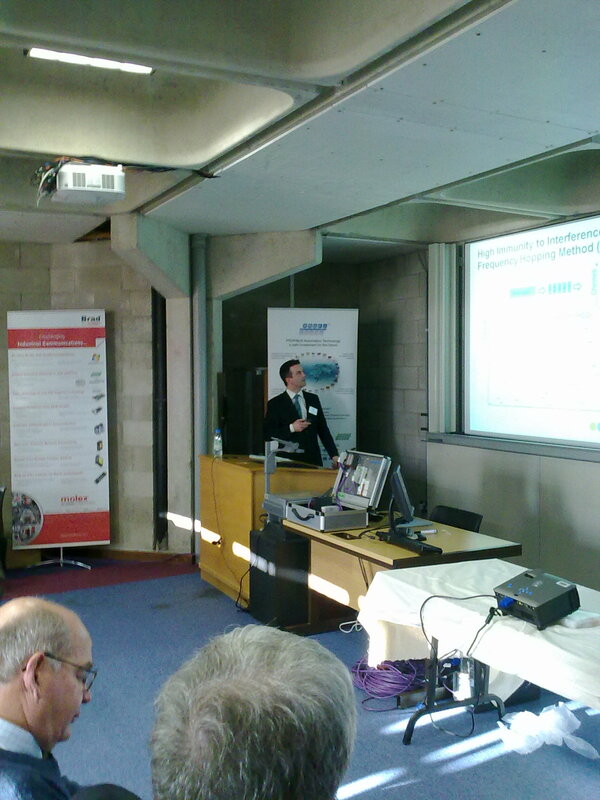 In what is hoped to be a biennial affair the first ProfiBus Ireland seminar was hosted by Limerick University’s Automation Research Centre (ARC) on January20th 2010. Hassan Kaghazchi of ProfiBus Ireland and the Limerick University was responsible for the organisation of this very successful event. Speakers and Organisers: From left: Joost Van der Nat, Hassan Kaghazchi, Conal O'Reilly, Steve Dickinson, David Maher, Joachim Lauer, Nigel DeHaas, Eric Gory, Jorg Freitag. It was very well attended and over 50 people attended. The progamme comprised of a morning with eight short presentations from a truly international group of speakers including Profibus International (PI) Chairman Jörg Freitag. There were many opportunities for hands-on demonstrations. The demonstartions panels constructed by ProfiBus Ireland members under David Maher of Elmar Engineering, The afternoon was an optional tour of the Bulmers, state of the art cider making facility in Clonmel where many of the ProfiBus techniques, discussed in the morning were seen in an actual plant. This part of the day was organised by Matt Wilhite of molex with the cooperation of the Bulmers plant engineers. 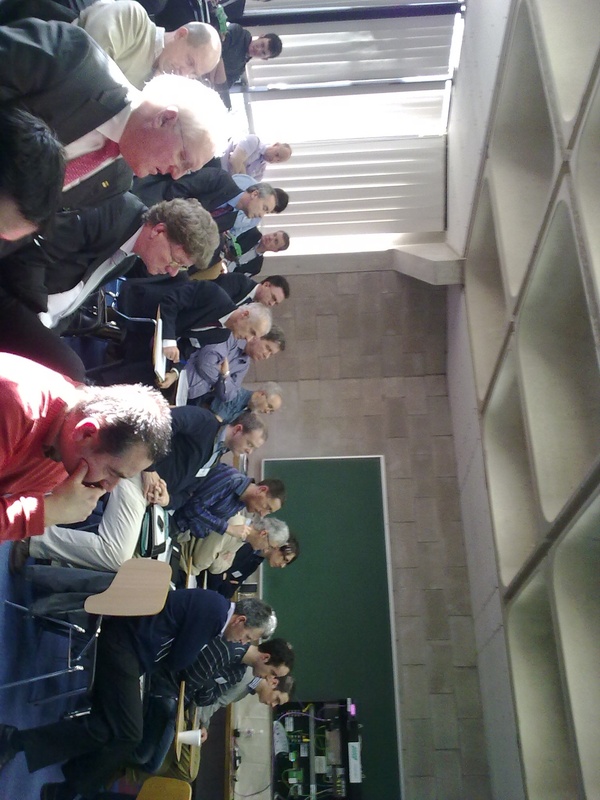 A pdf version of each presentation is available to download from the Profibus Ireland site. The tour of the Bulmers Clonmel plant took place in the afternoon. This plant manufactures the traditional Bulmers range for Ireland and Magners Irish Cider for the export market. As part of the C&C Group it also produces Carolan’s Irish Cream, Tullamore Dew and other products at the site. The tour was fascinating as it concentrated on the technical aspects of control especially in the very impressive bottling plant and then in the manufacturing of the cider itself from the simple apple to the finished refreshing brew. The tour also emphasised the complete use of the raw materials and its minimum impact on the environment. For instance the pulp left after the extraction of the apple juice is used for anamal feed – primarily for deer. PROFIBUS: A Pocket Guide by Ron Mitchell is a pocket guide provides a basic overview of PROFIBUS operations, installation and configuration, wiring schemes, troubleshooting, and tips and tricks. Also useful for engineering management seeking a summary understanding of PROFIBUS. Illustrative figures and technical tips are provided for quick reference. It is published by the International Society of Automation.